Our jade glass is a testimonial to luxury and elegance. This classic plaque is a timeless choice for any inventor. Beveled edges bring uniqueness to this geometric optical crystal plaque which rests on a cut edge for added impact and style. 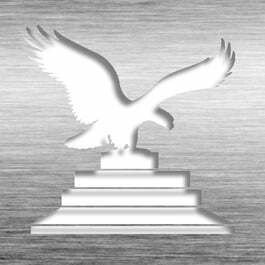 This patent plaque offers a bold combination of contemporary glass, a premium laser engraved black metal plate with silver text, and a bright silver trim. All plaques include satin silver hardware for easy displaying. This plaque is perfect for any desktop or office display area. 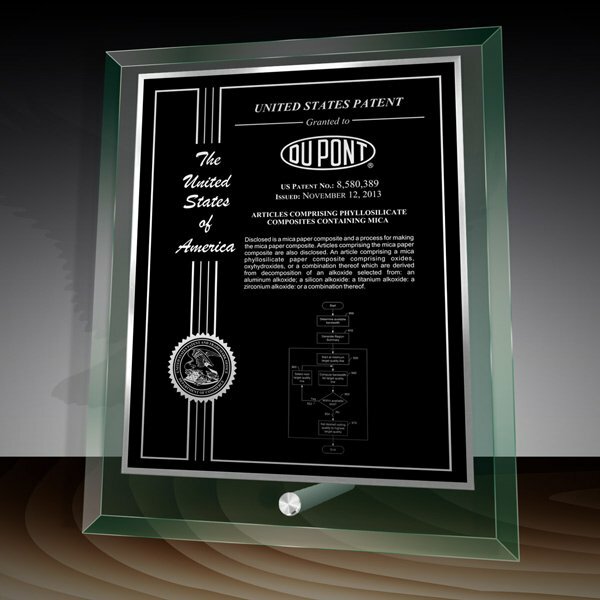 This Patent Award - Glass Desk Plaque Jade DG-10BSJ is part of our Patent Desktop Award Series of products, check out other products & options available in the Patent Desktop Award Series of our selection. This Patent Award - Glass Desk Plaque Jade DG-10BSJ can be modified to your requirements and is available for your corporate award programs.